Who are the Phillies' clutch players in the playoffs? 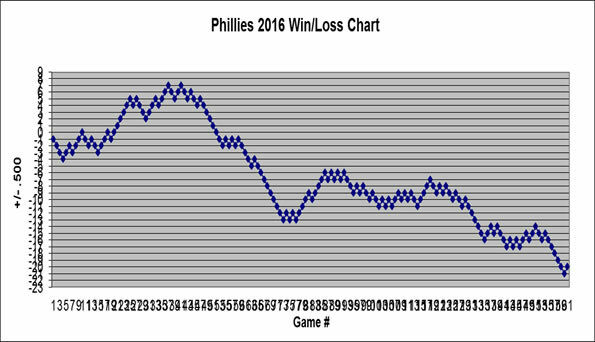 With the postseason just 2 days away for the Phillies, all regular season stats return to zero and the "second season" begins. With that, it seems appropriate to investigate how each Phillies player has performed in the playoffs. To determine the Phillies' "clutch" hitters in the postseason, we took their career regular season and postseason totals for average, home runs, and RBIs and ran them over 162 games. To come up with those figures, we simply multiplied their per-game averages by 162. Let's use Carlos Ruiz as an example. Using his career regular season totals, if Chooch were to play a full 162 game season he would have 9 home runs and 63 RBIs and if he played 162 playoff games he would have 15 homers and 65 RBIs. As a whole, the Phillies average drops a total of 88 points in the postseason, while the home runs increase by 36 and the RBIs jump by 60. That's not bad considering that in the playoffs they are generally facing each team's top three starters. The real fun comes at the individual level. Carlos Ruiz: Chooch's average is 43 points higher (and highest on the team) with 6 more home runs and 2 more RBIs. Jayson Werth: Werth's numbers are higher in all areas: 13 points higher average, 25 more homers and 12 more RBIs. Shane Victorino: Victorino is the definition of clutch. Shane's average is similar, but he has ridiculously better power numbers with 18 more HR and 56 more RBI. His postseason RBIs are nearly DOUBLE his regular season totals. If Victorino's RBI totals are removed, the Phillies would have 32 less RBIs as a team in the postseason. Jimmy Rollins: Who would have thought this? Jimmy's average is 41 points lower in the postseason and he has 16 less RBIs. Raul Ibanez: His average drops 45 points and he has 9 less homers and 7 less RBIs. On the pitching side we focused just on earned run average and only included pitchers with a minimum of 8.2 innings postseason experience. No stats from any specific player jumps out, but it is interesting to note that Oswalt and Hamels, who have both been pretty successful in the playoffs, both have higher ERAs in the postseason. It is also intriguing that all but one of the Phillies relievers have a lower ERA. The biggest name missing from these lists is Roy Halladay. We will see where he fits in beginning on Wednesday. A game like yesterday’s no-hitter by Roy Halladay doesn’t come around very often. In fact, this is only the second time in baseball postseason history fans were able to witness a no-hitter. Exactly how rare was Roy Halladay's NLDS no-hitter for the Phillies? There have been a total of 1,255 postseason games in major league history and exactly 2 no-hitters. In other words, a no-hitter has been thrown in 0.159% of all baseball playoff games. Add to that the fact that Halladay is the fifth pitcher to throw two no-hitters in the same season puts Doc in some pretty exclusive company, indeed. In order to give Halladay’s performance the credit it deserves I will overanalyze the heck out of it. And in true Roy Halladay fashion, let's let the numbers speak for themselves. Finally, as Roy Halladay was quick to point out himself, Carlos Ruiz played a huge part in the no-hitter. The number show that Chooch did a remarkable job of mixing pitches. The analysts on MLB Network also mentioned how his amazing ability to "receive" Halladay's pitches in such a way that it nearly forces an umpire to call strikes. Doc and Chooch are quite a pair. Boy, how things can change in one year. We are just a day removed from watching Cole Hamels pitch a complete game shutout in a clinching NLDS game. Yet not much attention has been given to the job Cole Hamels has done for the Phillies in 2010. He got plenty of attention last year. At this time last year, Cole Hamels lost confidence in the fans and his manager after comments he made in the World Series. Hamels had a 1-2 record with a 7.58 ERA in four starts in the 2009 postseason. Following his Game 3 outing in which he allowed five runs over 4 1/3 innings in an 8-5 loss, Hamels said, "I can't wait for it to end. It's been mentally draining. At year's end, you just can't wait for a fresh start." Hamels was obviously frustrated and I doubt he meant that he was giving up and quitting on his team. Regardless, those are not comments indicating a pitcher who wants to put the team on his back and take the ball in a crucial World Series game. Charlie Manuel apparently was not impressed with Hamels or his comments either, as he did not announce who he would use as his game 7 starter. We will never know if Charlie would have chosen Hamels in game 7 since the series ended in six games. But when a manager doesn't automatically go to his "ace," it is evidence to me that he lost all confidence in his pitcher. The 2010 Cole Hamels would have slapped his 2009 version in the face. Hamels followed up his best regular season in his career with possibly his best single performance of his career. Hamels oozed confidence in his NLDS appearance. The look on his face after giving up a leadoff single in the ninth said it all. Cole Hamels' expression showed clear determination to finish what he started. He went right after the next batter and forced one of the National League's best hitters, Joey Votto, to hit into a double-play. Then Hamels struck out Scott Rolen to seal the deal. The job Cole Hamels has done for the Phillies must not go unnoticed. Hamels knew he needed to improve after 2009 and that's exactly what he did. He got into the best shape of his life, developed a new pitch, and dramatically improved his demeanor on the mound. Baseball experts will give all the credit to Roy Halladay for setting the example. It's about time we give credit to Cole Hamels. With the National Championship match up set between the Phillies and Giants, it is time to breakdown the team comparisons again. As with the NLDS, we will look at the individual Giants number against the Phillies and of course the Phillies numbers against the Giants. Overall, the numbers don't seem to be in the Phillies favor. But let's save the analysis until later. Analysis: These numbers indicate that not a single Phillies starter has good career numbers against the Giants. Nobody has horrendous numbers, but outside of Oswalt each pitcher has a significantly higher ERA than their career numbers. Analysis: The Phillies hitting numbers don't really say much of anything here. The batting averages are lower for all of the batters, but the production numbers are about the same. Analysis: These numbers are enough to make you cringe as Phillies fans. Lincecum and Sanchez both have good numbers against the Phillies in their careers. The one pitcher with poor numbers in his career is Matt Cain, but he pitched well in his one start this season. You are out of luck if you were hoping we owned any of the Giants starters. Analysis: There is good news to this story, Phillies fans. The Giants hitters stink just as much against the Phillies as they do against the rest of the league. As far as overall numbers are concerned, the Phillies and Giants both have great pitching staffs with the edge to the Phillies with a shortened rotation. The Giants have one of the worst offenses in the league and the Phillies have one of the best. So how do the head to head numbers compare? The head to head numbers tell essentially the same story for the Giants compared to the rest of the league. They pitch very well against the Phillies but their hitting is bad. The offensive numbers for the Phillies are pretty close, as well. The problem is with the Phillies starters. Combined they have a 12-15 record with a 4.37 ERA. That's not awful, but it is certainly not something for the Giants to worry about. It gets even worse when you break it down to just the 2010 season where the Phillies starters are 2-5 with a 4.56 ERA. Believe it or not, Joe Blanton did the best out of all starters. Without Blanton, the "three headed monster" went 1-5 with a 4.80 ERA. I didn't like this match up before, and I like it even less now. The Phillies are clearly superior to the Giants, but not a team you want to pick to play in the NLCS. It was evident after the very first batter that Roy Halladay did not have his best stuff in his Game 5 start in the NLCS. In addition to lacking control and movement, he was unable to put away batters which drove up his pitch count. But in my mind this might have been a better performance that the no-hitter. He barely even needed to try in the no-hitter because his stuff was just that freakin good. Halladay's second NLCS appearance was a different story. Imagine standing on the mound with your team's season on the line knowing that you have nothing. That's what Halladay faced in tonight's game, but he gutted it out. Just for fun, I thought we would compare the no-hitter and his last start. I don't know what, if anything, you can read out of this, so I'll you decide whatever you want. Did Halladay's groin strain make a difference? We all know by now that Roy Halladay suffered a mild right groin strain in the second inning of his Game 5 outing in the NLCS, but it was a mystery to most fans and players until we were told after the game. If Halladay fooled most of us about his injury, how much of an effect did it have on Doc? To answer that question, the baseball geek inside of me decided to look at every single pitch to discover what patterns may emerge. Through my investigation, the evidence is clear that Halladay was hurt in the second inning just as the Phillies told us. The most incriminating evidence surfaced by examining Halladay's velocity. There was a clear drop-off in velocity immediately after pitch #32. On that particular pitch, Halladay threw a changeup for a ball to Sandoval with one out in the second. Other than the fact it was the ninth pitch of the at-bat, there was nothing peculiar about the pitch. Nevertheless, I would bet something happened on that exact pitch. As you can clearly see by the chart below, Halladay's velocity on all of his pitches dropped over 3 mph on average after pitch 32. When every single pitch drops the same amount, there is certainly something going on. The injury didn't seem to change Halladay's pitch selection much. I thought he threw significantly more curveballs in this outing, but it probably just seemed that way because it was much slower and obvious when he through it. Here is Halladay's pitch selection before and after the injury. The injury also did not seem to play a major role in the types of outs, either. His breakdown of 6 groundouts, 6 fly outs, and 5 strikeouts seems normal. They type of strikes shows that the Giants weren't swinging and missing as much as normal. He had a total of 7 swinging strikes against. That is a particularly low number, especially when considering he had 19 swinging strikes in the no-hitter. Those figures may not indicate injury, but they are intriguing, nonetheless. What does this mean about Halladay's future? As long as he is still able to pitch, Halladay should still be more than able to dominate if he gets another game. Halladay's success is based on control and movement, so a drop in speed should not affect Halladay as much as most other pitchers. Hopefully the Phillies win the next two and give us a chance to find out for ourselves. The Phillies will not play another baseball game today. That's a tough pill for fans to swallow, for sure. And for the first time in three years the Phils will watch the World Series at home. This team that brought us so much excitement and joy over the last three seasons was unable to get in done this year. Jeez, all the missed opportunities! When the benches cleared in the third after Utley's hit-by-pitch the Phils had a 2-0 lead, Sanchez was gone, the Phillies had runners on first and second with no outs, and CBP was an insane asylum. You had to figure at that point that the Phils were going to Pummel the Giants. But Howard, Werth, and Victorino got nothing out of it. The Phils left the bases loaded in the fifth and wasted Ibanez's leadoff double in the sixth. And the Phillies scored nothing with runners on first and second and nobody out in the eighth when Victorino was doubled up on a Ruiz liner to first. And finally in the ninth when Howard was caught looking for the final out. It hurts knowing that we were clearly the better team. The Giants played there absolute best and we still nearly beat them. But the painful truth is that the Giants were hungrier and got the big hits when they needed them. It's one thing to get shut down by a dominant starter, but it is quite another thing when you are given the chance and can't do anything with it. But a s disappointed as we all might be, maybe we should all be thankful to the Phillies for once again giving us something to cheer about. Ten years ago we would have been satisfied with a .500 season and now we are calling a Game 6 defeat in the NLCS a failure. Don't forget that. And there's no reason why we can't be back next year with three stud starters and essentially the same lineup. Hey, it will make it that much sweeter when we win next year. What will the Phillies payroll look like in 2011? Mere moments after Ryan Howard struck out to finish the Phillies season, focus quickly shifted to Jayson Werth and the Phillies' payroll. Will or won't the Phillies keep Werth? Before even considering re-signing Werth, we need to examine the Phillies payroll. A quick look at the payroll provides a clear answer. According to USAToday.com, the Phillies 2010 payroll was $141.928 million. Excluding arbitration increases, the Phillies will immediately add $16.55 million just to maintain players under contract. Let's assume that the Phillies will allow Jayson Werth and Jamie Moyer walk away. It is unlikely the Phils will exercise JC Romero's option for 4.5 million next year and will instead buy him out for $250k. And for simplicity sake, let's say we keep Durbin, Contreras, and Sweeney at the same salary (their salaries shouldn't change much anyway). This would give the Phillies an extra $17.75 million. In this scenario in which the Phillies add $16.55 million for increasing contracts and remove $17.75 million, the Phillies would have an extra $1.2 million to add a right fielder, one starter, and one reliever. Inserting Domonic Brown in right, Kyle Kendrick as the number 5 starter, and grabbing another reliever for $1.2 million brings the Phils to essentially the same payroll next year. Therein lies the problem. In order to keep Werth using this scenario, the Phillies would need to ADD $15-17 million to keep him. There is a greater chance that you will see Charlie Manuel playing right field than there is for the Phillies to bump their payroll to $156 million. The moral of this story is that Ruben Amaro better be pretty darn creative if he wants to keep Werth in Phillies pinstripes. For a more detailed look, visit our 2010 Phillies salaries and Phillies player contracts pages.